More than 130 restaurants are participating in DFW Restaurant Week. 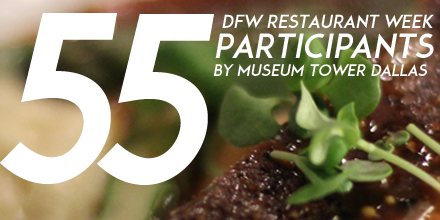 55 are located nearby Museum Tower Dallas. Our 24/7 concierge is ready to make your accommodations to be among the first to get a taste of what select restaurants will be presenting during the 17th annual DFW Restaurant Week. On August 7 at Centennial Hall in Fair Park, Meso Maya, Dallas Chop House, Bistecca and others will serve choice bites and cocktails before officially participating in DFW Restaurant Week August 11 - 17. Set to a circus theme, you'll see acrobatic performance, hear live music and more. Click here to view the menu. Both the kick-off event and DFW Restaurant Week benefit the North Texas Food Bank and the Lena Pope Foundation.